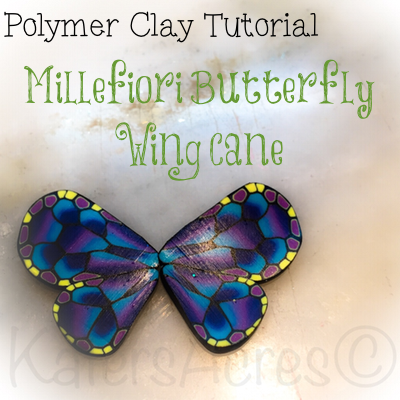 #PolymerClay Butterfly Wing Cane #Tutorial http://t.co/7KYSN98OY9 It’s easier than it looks, trust me! Make your own wings today. This spring I’ve been busily making some new canes to enjoy and be creative with. One of those that I especially like using are butterfly wing canes. I’ve put butterfly wings on everything from glass jars, Parker, Lolly, necklaces, & even this past week’s dragons. Here’s my really quick, simply, and easy mini-tutorial for making your own butterfly wing cane. Choose 2-3 colors of clay to make a Skinner Blend. Fold your Skinner Blend into several sections (color aligned on top of each other) and run through the pasta machine to create a continuous strip of color. Make another skinner blend, this time using only 2 of your colors. Take each skinner blend stack and manipulate it into a log. Cover each skinner blend log with black clay. Make 2-3 different colored “plugs” to use for your cane as well. Reduce each Skinner Blend log until it is 7″ long. Reduce each plug until it is at least 12″ long. These plugs you will use as the “edge” of the butterfly wings, so make sure you reduce them enough. Assembly of your wings is easy! Take each 1″ section and arrange it so it’s pleasing to your eye. There’s no exact way to do this, just arrange them so you think they are pretty. You want one of your canes to be significantly bigger than the other (this will be your top wing). Reduce each wing section individually. (I do this by reducing the cane round and then manipulating it into a petal shape when it’s the size I want it). When you have the large & small wing reduced, place the two canes together and gently “pinch” the point where they join to create one seamless cane. Slice & use as desired.